Gerunds are words that are formed from verbs but act as nouns. You'll be able to spot them because they will be a verb + ing acting as a noun. The word swim is a verb. Swimming is a verb with an -ing ending acting as a noun. It is the subject of this sentence. Tip: Words that are formed from verbs but don't act as verbs are called verbals. There are two other types of verbals: participles and infinitives. They can do anything that nouns can do. That means that they can be subjects, direct objects, objects of prepositions, predicate nouns, and more! These consist of a gerund and the words that modify and complement it. Swimming in the pool is fun. I love listening. I love listening to my favorite band. Reading rocks! Reading books on the porch rocks! You remember that these act as NOUNS, right? Of course you do. You also remember that nouns are modified by adjectives, right? If you aren't comfortable with that yet, you should probably be reading up on the eight parts of speech. Adjectives and adverbs are called modifiers because they modify (describe) other words. Okay, let's get back to the matter at hand. Let's look at one of those examples from above. You may have noticed that in the pool is an adverbial prepositional phrase. It is telling us where the swimming happened. You should now be saying to yourself, "Hey! Nouns can only be modified by adjectives. What gives, Elizabeth?" Here is what gives. 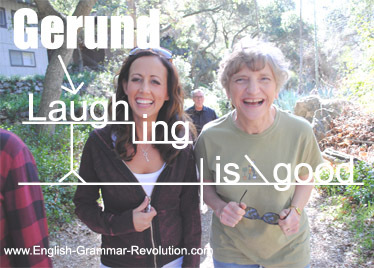 ---> Gerunds are formed from verbs. Even though they are officially nouns, they still carry some of the attributes of verbs. Complements are things like direct objects. They complete verbs. These babies can have complements! Running marathons is my favorite activity. Marathons is the direct object of running. Are you ready to hear something kind of strange? They can even have subjects... sort of. Subjects are usually in the subject case (I, he, she), but these subjects will always be in the possessive case (his, her, my). His snoring keeps me awake. His is the "subject" of snoring. Diagramming sentences is fun! Subject Sentences is the direct object of diagramming. I love listening to my favorite band. Direct Object To my favorite band is a prepositional phrase modifying listening. Mary's loud eating really bothers me! Subject Mary's is the "subject" of eating. Loud is an adverb modifying eating. These sit on steps when you diagram them. 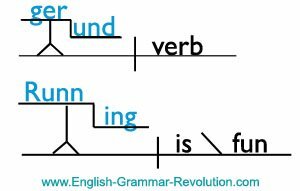 The verb part goes on the top part of the step, and on the -ing goes on the bottom part of the step. After that, you diagram the modifiers and complements just as you would with any other word. I am so glad I joined the Grammar Revolution. You bring spice to our English department! Test yourself with this worksheet.